Disney just aired the John Carter Super Bowl 2012 Ad Trailer. John Carter is based on the classic novel by Edgar Rice Burroughs. The movie tells the story of a war-weary, former military captain John Carter (Taylor Kitsch), who is inexplicably transported to Mars where he becomes embroiled in an epic conflict. John Carter will be in theaters on March 9. 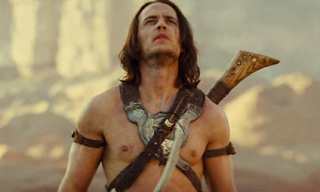 Watch the John Carter Super Bowl Movie Trailer below. Walt Disney Pictures and the NFL are giving Super Bowl XLVI viewers an opportunity to enter The John Carter Journey to the Super Bowl Sweepstakes during the Super Bowl on Sunday, February 5, 2012. The Grand Prize winner will receive a trip for two to the 2013 Super Bowl game. Viewers who are interested in entering the sweepstakes should tune into the game and watch for the John Carter commercial. During the airing of the 30-second spot, a code will be revealed. Viewers can then go to http://NFL.com/JohnCarter and input the code to be entered in the sweepstakes.